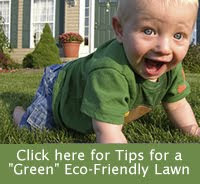 the right choices for an eco-friendly landscape. 3) At what height should you mow your lawn? 5) How should you clean up fertilizer spills in your driveway? 6) Which of the following is a benefit of using mulch? 7) Which of the following help create a wildlife friendly landscape? 8 ) You should apply pesticides at the first sign of insect damage. 9) Which of the following help control pest insects?